[By Nick, 2012 only] Ever since my experience with Gelati-Da, I’ve had a serious craving for coffee ice cream. I had originally set out to find Blue Bunny’s Cup o’ Coffee Cake but to my disappointment they were all sold out. Feeling defeated, I went to exit the ice cream isle when out of nowhere the word new caught my eye. 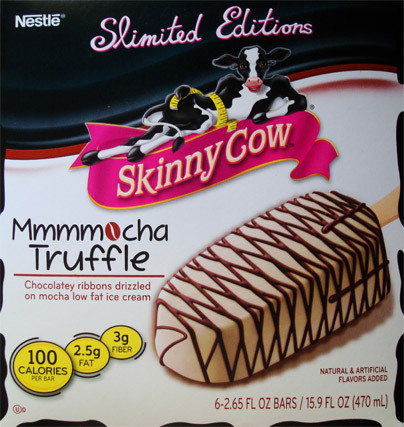 Skinny Cow Slimited Edition Mmmmocha truffle bars? Being a fan of puns and enjoying other truffle bars, I knew I had to pick these up. 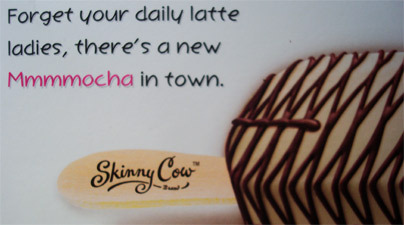 It looks like Skinny Cow’s marketing department took some classes from the Ben & Jerry’s folks. Slimited is almost ingenious while Mmmmocha seems to be a stretch to me. I would’ve gone with Mooocha but that’s just my humble opinion. Though the inclusion of a coffee bean for the ‘o’ is pretty clever in itself. My only problem is this little tidbit on the back. Buying Skinny Cow products is demasculinizing as it is. This right here is just adding insult to injury. Guys drink lattes too, Nestle. Well not any guys I know of but still discrimination is not cool. Now Skinny Cow is all about coming up with “healthier” treats so I don’t see it being fair to compare these to their premium siblings. Coming in at 100 calories and only 2.5 grams of fat, these bars are on the lower calorie end of the dessert spectrum as well. Straight out of the wrapper, this has to be the most visually appealing novelty I’ve ever seen. When I think of mocha, I think of a dark brown so I was taken aback when it was a few shades lighter than I had imagined. Looking back at the box though, it seems to be on par with what’s advertise. The drizzle of chocolate is a nice touch as well. It gives the bar a sense of elegance which I think would go over quite well with their target market. As for taste, the mocha flavor is on point. It’s not too bold that you get over powered but it’s not too sweet where you think you’re eating some chocolate with a hint of coffee. I actually felt like I was having an iced mocha coffee just in an ice cream bar form. The bar was very creamy and a lot less chewy than the other truffle bars I have had in the past. That could be from me taking time to photograph the bar but it didn’t seem to melt as fast either. The chocolate drizzle on the bar is mainly there for decoration and some added texture. The mild chocolate flavor is easily masked by the mocha base. It provides a little crunch that is highly appreciated and contrasts nicely with the ice cream. Nice job Skinny Cow on putting out a limited slimited edition product that was well thought out. From the packaging to the bar itself this one is definitely a winner. If you’re a coffee fan, I would definitely give these a try while they last. The blue bunny cup o coffe cake is probably my least favorite out of duffs line of ice cream. I'm a big coffee ice cream fan too. It's not that it's bad, I think I might of had high expectation for it. Thanks for the heads up, I'll be sure to keep my expectations in check once I finally find it.